in Google Apps to help administrators manage iPhone, Nokia, and Windows Mobile devices from the Google Apps control panel. These policies let employees access information from their phones while helping administrators keep corporate data more secure. Today, we are announcing new mobile device management options for Google Apps administrators. Starting this week, these policies will be available to all Google Apps Premier and Education customers. They can be accessed from the 'Mobile' tab under 'Service Settings' in the Google Apps control panel. It’s our mission to provide users with seamless access to their data while allowing enterprise administrators to centrally manage a diverse range of mobile devices. We’re working to enhance our device management options and to expand our list of supported devices – including Android later this year. If you have any questions, please check out our Help Center documentation. Earlier this year we announced support for mobile device security policies in Google Apps to help administrators manage iPhone, Nokia, and Windows Mobile devices from the Google Apps control panel. These policies let employees access information from their phones while helping administrators keep corporate data more secure. Today, we are announcing new mobile device management options for Google Apps administrators. loving the ActiveSync support in Google Apps!!!! :) It is totally awesome! Why no love for Android? 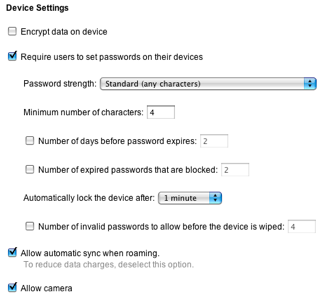 Good more admin controls for mobile device management in Google Apps. Umm .. what about Android? And when will this be available for Android devices from Google Account's?